Drosophila melanogaster—the common fruit fly—is widely used in laboratory experiments because it can provide insights into the biological processes of other, more complex organisms, including humans. However, what is seen in fruit flies in the lab may bear little resemblance to what is seen in fruit flies in the wild—especially when it comes to the bacteria found in their intestinal tracts, two University of Rochester researchers and a colleague at Cornell report in Ecology Letters. Their findings challenge some widely held assumptions about whether an organism’s diet determines the bacteria likely to be found in its gut. The findings also challenge a recent hypothesis about how this bacterial population should vary among different species. 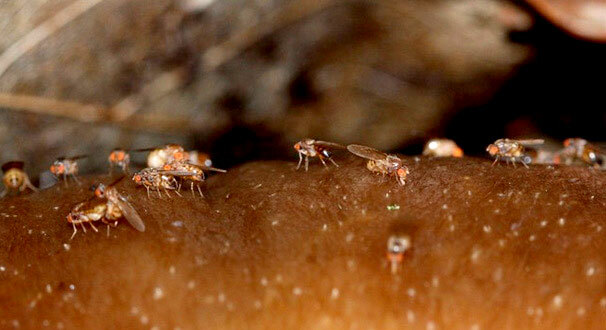 Wild Drosophila fruit flies, like these shown feeding and mating on a mushroom cap, were collected by Vincent Martinson, a postdoctoral research fellow, in the woodlands around Rochester to study the microbes in their intestinal tracts. The white dots are the fruit flies’ eggs. 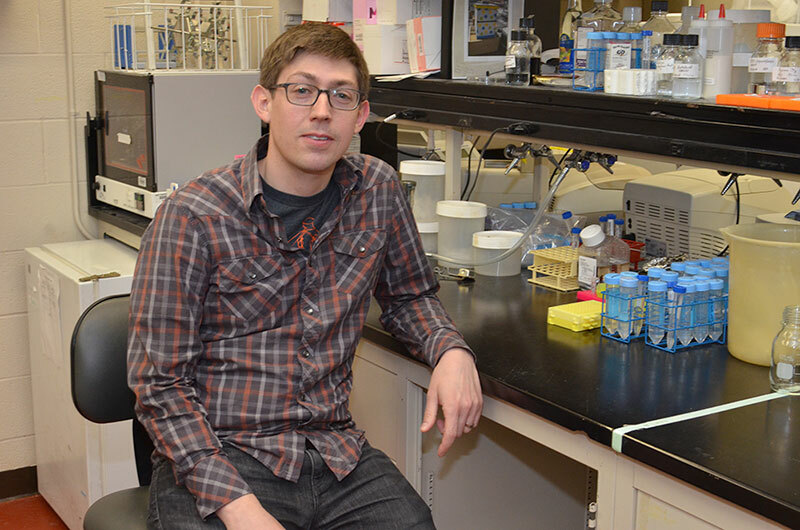 Lead author Vincent Martinson, a postdoctoral research associate in the lab of John Jaenike, professor of biology, collected 215 wild, mushroom-eating fruit flies of four different but ecologically overlapping species in Rochester area woodlands. Theirs is the first study to analyze gut microbiota (the microbe population living in the intestine) at the level of individual flies in wild Drosophila. Intestinal microbes enable an organism to process otherwise inaccessible energy sources in the diet, exclude pathogens, and detoxify certain compounds. The communities of bacteria in the intestines of the wild flies he collected were quite different from those found in the guts of similar species in the lab. This is a clear indication that the lab is an “abnormal environment compared to what the flies experience in the wild,” says co-author Jaenike. The exact composition of gut bacteria varied widely from one individual fly to another, even within the same species. However, there were broad similarities in the types of bacteria found in the guts of all four species despite the “deep” genetic divergence of those species. This contradicts a relatively new hypothesis suggesting that widely divergent species should exhibit fewer similarities in their microbiota. 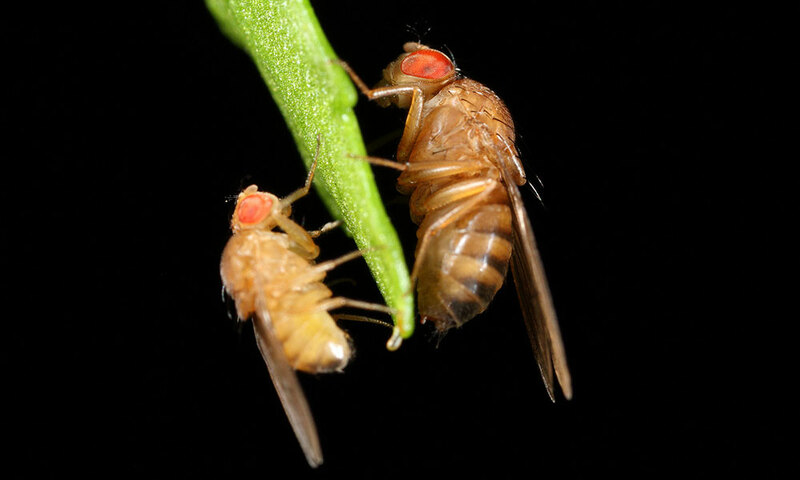 The findings suggest researchers may want to rethink how they use fruit flies in their experiments. Humans can also show considerable individual variation in gut microbiota, “but the underlying causes could be different in humans than in flies – or it could be similar. We just don’t know yet,” Martinson says. Angela Douglas of the Department of Entomology at Cornell University was also a coauthor.